Ice shelves are the platforms of floating ice that form when a glacier flows into the ocean. They are often many hundreds of metres thick and millenia old. Ice shelves are distinct from sea ice, which is frozen ocean water. Sea ice is only centimetres or a few metres thick and often only lasts one year before melting or drifting away. Ice-shelf flexure is the term we use to describe the bending of an ice shelf in response to a force. When a lake forms on an ice-shelf, we expect the ice to depress, move downward, at the centre of the lake due to its gravitational load. June 2018 - PhDs are fast changing things, and some of this page is out of date. Come back soon for an updated version of this. The goal of my PhD thesis is to 'Evaluate the surface hydrology of ice shelves'. As I explain in 'Why? ', ice shelves are very important for the stability of Antarctica and some Arctic glaciers. They surround much of the Antarctic continent and hold back the ice that flows into them. The loss of ice shelves with climate change could play a huge role in the loss of ice from Antarctica, and therefore in global sea-level rise. Warming ocean water can melt, thin and weaken ice shelves from below. Warming air can cause meltwater to develop on the surface, forming lakes and filling cracks, and weakening ice shelves from above. I study the latter. For the first part of my thesis, I conducted a study of surface lakes on the floating tongue (a type of narrow ice shelf) of Petermann Glacier, on the north coast of Greenland. Utilizing Landsat 8 images (a NASA satellite), I used an algorithm to identify and measure the area, depth and volume of lakes on the glacier tongue throughout the summers of 2014-2016. 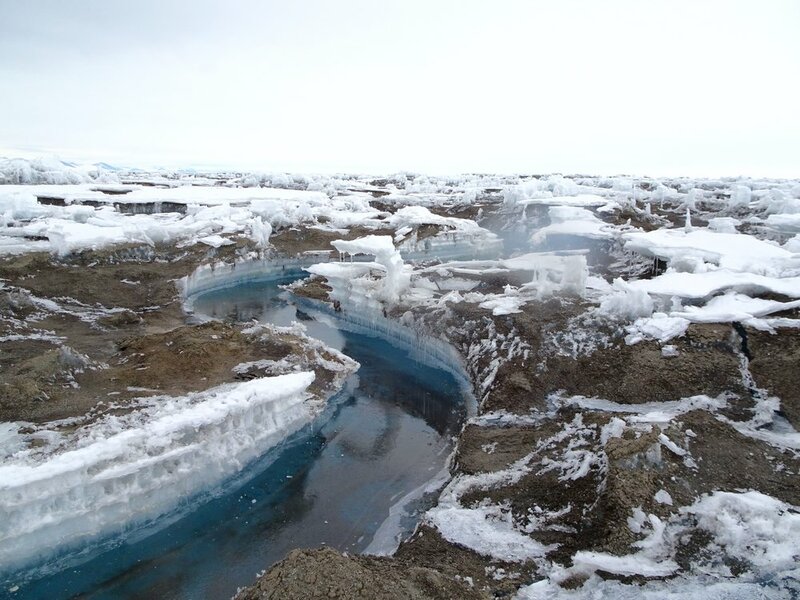 I related these changes - the formation, growth, drainage and freezing of lakes - to temperature records and analyzed the implications for the glacier, particularly its stability. This is the first study of surface lakes on a Greenlandic floating ice tongue and is now published. Presently, I am researching the development of lakes on the McMurdo Ice Shelf, Antarctica using a combination of remote sensing and field data that we collected over the course of three trips during the 2015/15 and 2016/17 austral summers. I am preparing a paper that analyzes the development of previously undocumented features that we called 'pedestalled relict lakes' that develop as a result of the unusual surface conditions on the McMurdo Ice Shelf. Additionally, I am working on modelling the development and flexural effect of these features. This will allow us to assess their potential to form on other ice shelves, and affect their stability, in a changing climate. More information will be provided on this work when the forthcoming papers have been published. I am also involved in my research team's wider project (led by Doug MacAyeal and Alison Banwell) to improve understanding of how ice-shelf flexure. Modelling studies by Alison and Doug have demonstrated that the presence of lakes on an ice shelf causes a flexural response but it has not been previously directly observed. The primary goal of our fieldwork in Antarctic (2015-17) was to make direct observations of this by deploying high-precision GPSs around water bodies on the McMurdo Ice Shelf. We also deployed seismometers to 'listen' to the ice as it flexes and other processes take place and weather stations to relate changes in the ice shelf to meteorological factors. A paper led by Alison about the development of a rift on the ice-shelf between our first and second field seasons is already published and more are in preparation. Follow our facebook group 'Explorers of the McMurdo Ice Shelf' to follow our work.